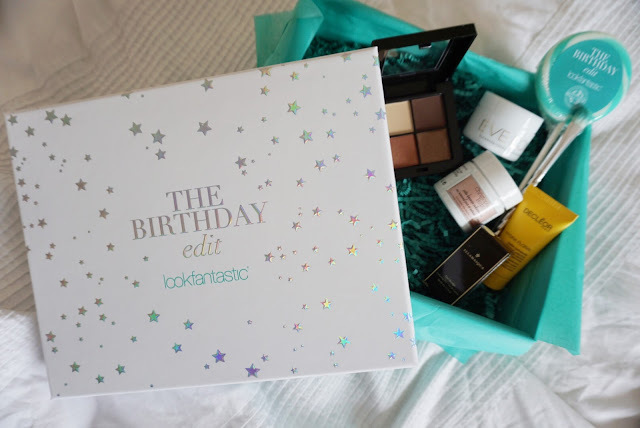 This month's box from Look Fantastic is extra special, as it is their Birthday Edit! It contains some really wonderful products this month, so I thought I'd do a run down of what's included in case you'd like to pick up the box yourself. I actually did some filming with Look Fantastic for this month's box too (specifically the Decleor and Christophe Robins products) so look out for those! First up is the makeup (my fave bit!) - you get an eyeshadow quad from Hikari, which contains some easy to wear warm shades (2 mattes and 2 shimmers). Also included is a mini Illamsaqua Contouring Gel Sculpt, which is a sheer gel contour stick. It looks really interesting, and unlike any contouring stick I've seen before, so I'll see how this compares to my fave Benefit Hoola contouring stick! As a special birthday treat, you also get a Look Fantastic eyeshadow brush, which is super Instagrammable with the silver handle and blue/green bristles. For skincare, you get a mini pot of the Eve Lom cleanser (+ muslin cloth). I've heard a lot about this, and I'm a big fan of balm cleansers so I'm excited to try this one out! It contains some lovely nourishing oils, along with Cocoa Butter and Egyptian Camomile to soften and smooth the skin (sounds perfect for evening cleansing!). It can be used as a cleanser to take makeup off, or for a second cleanse after micellar water. Secondly, there is also a mini Decleor Hydra Floral Hydrating Light Cream included. I love gel-based moisturisers like this one in the morning as they don't interfere with makeup and feel nice and light on the skin. Finally, to make your hair super voluminous and fresh, use the Christophe Robin Cleansing Volumising Paste (travel size). This is a hair mask that not only exfoliates & invigorates the scalp, but also adds plenty of volume into the hair, hopefully making it super easy to get that salon blow dry effect! The clay ingredient helps to deep clean the hair, whilst adding denseness to the hair follicles for lift and thickness. It transforms to a foam when mixed with water and I actually filmed with this product so I can confirm it smells lovely and fresh too - definitely a good one for a weekend pamper sesh. 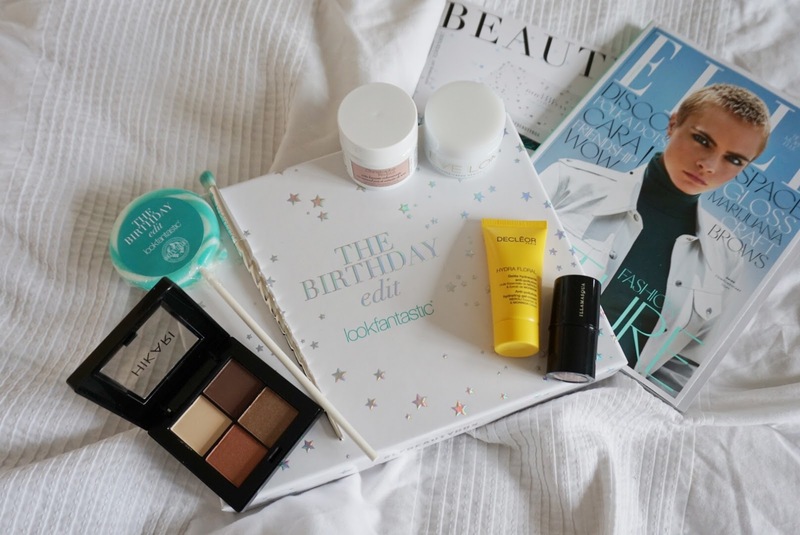 Of course, as included with all LF beauty boxes, you get a copy of Elle magazine, along with the Beauty Box magazine. As this is a birthday special, you also get a Look Fantastic lollipop this month too! What do you think of this month's box- will you be picking it up?